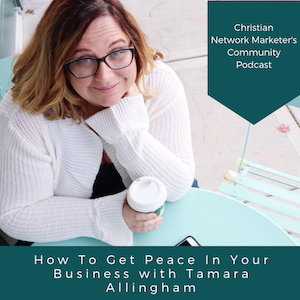 Today I have an interview with my friend and community member, Tamara, who has a network marketing business and does mindset coaching. We have been known to talk for hours and hours, but today we tried to keep our conversation to 15 minutes. You’ll have to catch the entire conversation to find out if we hit our goal. How is God working in your business? Can you please share some tips on public speaking since that is your zone of genius? What are your thoughts on the concept that “faith without works is dead”? The best gift God gave me, and I think, all of us is discernment. There is an expiration to how far I can see, but there is not to how far He can see. I’ve never regretted trusting Him when logic was telling me to go a different direction, but when I’ve been impulsive and went on baseline-logic alone, man, it bit me in the tail. He can see things that I didn’t see. I am glad that I allowed Him to order my steps; it’s a choice. Let Him do that. Discernment is confirmed through peace that brings a calm that cannot be explained. The world can’t give us peace. It is not another emotion that can be created, it cannot be duplicated by the enemy, and it is only something that can be found in scripture from God. Peace feels like “lightness.” What is the difference between comfort zone? And peace? Comfort zone is a manmade peace that still has angst and anxiety. Peace from God doesn’t have those things. I can create a comfort zone, but because I can create it, I can also mess it up. I have nothing to do with heavenly peace; I am just the recipient of it, and that helps. I think if we, those of us in business, relied more on discernment in business we would probably see less conflict and less yo-yoing. I feel strongly about public speaking because, when you break it down, it gives us an opportunity, since we are Christians, to stand and be a reflection of God’s goodness. I try and remember when I am speaking that people are not seeing me, but that I am reflecting His light. It is not about me but about me offering something to Him in front of them, and that makes it different. This removes the idea that I am going to win or lose or fail in front of them. The audience are just spectators in a vertical moment between God and I. Next, Tamara gives a public speaking tip that is so good, you will need to watch or listen to the entire conversation to hear it. Regarding faith without works, it’s easy to stand behind the thought that “God is going to build it for me.” There is some truth to that. However, when Jesus was here on earth, He never did it all for them. He equipped people, sent them out, and was waiting for them when they came back. We can’t wait around, do nothing, and expect Him to drop the Mother Lode in our laps. He is going to bless you, but He is going to bless you in accordance to your faith. God will meet you at the destination, but don’t hide behind the idea that He is going to do it all for you. Situations like Moses faced at the Red Sea made him a leader. He was scared but he did it anyway. Moments like that create leaders. These are just some of the highlights. You definitely want to check out the entire conversation by watching the video below. Thank you for reading today’s post. Share with us how God is working in you and your business in our Facebook group, and let’s continue the conversation! P.S. Would you like to connect to chat about how to advance your business? Just send an email to team@emergesalestraining.com. P.P.S. If you would like to learn more about attract your ideal customers, I would love for you to join me Friday, April 12th for my “Attract Your Ideal Customers with Live Video” workshop. You can get details and REGISTER HERE.